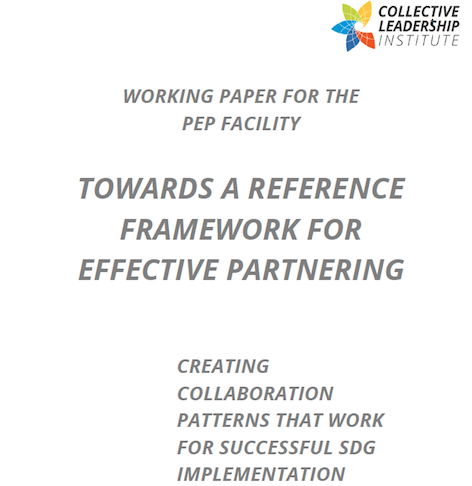 This paper, produced by PEP founding partner CLI for the PEP Facility, puts forward a set of principles for effective partnering, drawing on extensive partnering research globally. Many support organisations have developed handbooks, guides and tool books to help partnering processes succeed. There is also a growing body of research on what makes cross-sector partnerships effective. While there may be different effective ways to collaborate, it seems important to develop a framework that allows for integrating current approaches and helping actors to navigate the complex conditions that make partnering approaches for SDG implementation work. A common understanding of principles and approaches for getting collaboration to work, will contribute to improving effectiveness of existing and developing new of well-functioning, impactful partnering efforts.